Michael Anderson's feature film work includes: The Living Daylights. (full list to follow). Q: How long were you working on Aliens for? MA: I was on the film for over six months. Q: The actual film credits list yourself and David Litchfield as visual effects camera operators. Can you tell me which camera unit you worked with and on which stage? MA: I was with Leslie Dear's unit. I started on "G" stage and after six weeks moved over to "M". We all eventually ended up on "M" stage, there were eventually six seperate units all shooting on "M", each working behind black cloth separators. After the first six to eight weeks or so the live action was all over and done with. Q: I have a number of call sheets that I obtained from the production runner so they have been very useful for me to try and piece together which scenes were shot and in what order, were these strictly adhered to? MA: The call sheets don't necessarily follow what was shot on any given day. For example before Leslie joined the crew I was shooting with Paddy Seale on a process plate shot for the background action. The shot itself had 5 passes with the camera locked-off whilst each individual effect was done. The same piece of film went through the camera each time. Q: Can you tell me something about the use of storyboards on stage and how sequences were directed? MA: We had the storyboards on stage. Much of what we were doing involved matching up with the live action or cutting into something already shot. At one stage there was a whole stack of Super 8 video storyboards that Jim Cameron had initially shot in the U.S.
Q: Can you tell me a little about the problems with LA Effects and what it was like to work through such a period? MA: Jim Cameron had difficulty with LA Effects who were contracted to do all of the effects for the movie. 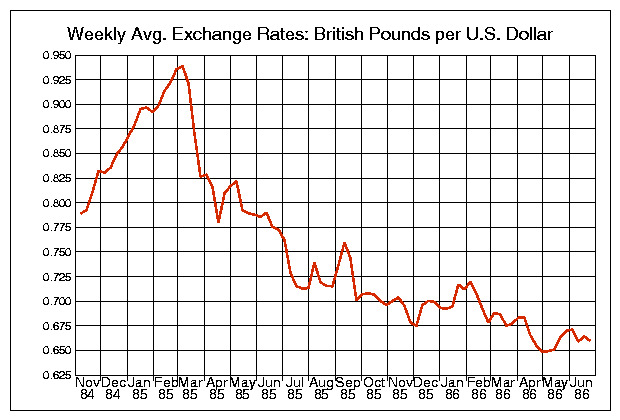 Towards the end of 1985 the dollar took a fall against the British pound. The budget allocated for the effects work suffered as a result. In two to three weeks of shooting the budget was cut in half. LA Effects were contracted to do as many effects shots but with effectively half the budget. Jim Cameron tried to raise money from Fox and even went so far as putting together a trailer. When Fox saw the trailer and what a quality film was being made they upped the budget. However LA Effects dropped out ten to twelve weeks into filming. The lawsuit was settled amicably many years later. LA Effects and 20th Century Fox. Q: You seem to enjoy talking about this film and have a good memory for such a long time ago. MA: I was on the film for such a long time that it is very easy to remember. Also I teach part-time at film schools, incorporating some of the films I have worked on into my lectures. Aliens figures quite prominently as it incorporated almost every type of visual effect shot imaginable. Q: Can I ask where have you taught? MA: Mostly at the London International Film School and the National Film and Television School at Beaconsfield (see note at bottom of page). Q: Did you work past the weeks that the production shut down for? Into the Queen and Power Loader puppet sequences? MA: I was on Aliens right to the end. In fact I couldn't quite go right to the end as I was scheduled for second unit on an Australian movie. Q: Can you tell me anything about the large scale Drop Ship model. I have seen photos of this model but it is unclear as to which scenes it was used in. Large scale Drop Ship model. Cockpit side reads Sgt. Pepper and Cpl. Clegg. viewed from the left hand side and 01 from the right. MA: That one was used in the scene where Signourney Weaver and the child are on the platform from which the android picks them up in the Drop Ship. The set-up for that shot took up the full length of "L" and "M" stages. It was shot at 125 fps with a whip pan by the camera. The model was on wires and because of its overall weight it went tail up and nose dived across the stage. I remember for that set up that there was around 50 crew, setting the model, setting of explosions etc. 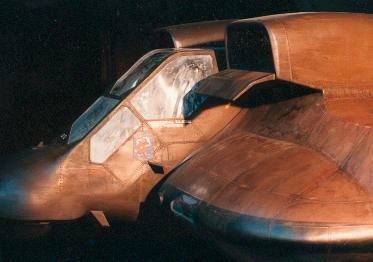 Another scene where the large scale model was used was where the crew go through the atmosphere and the ship is being bounced around. There were also some smaller fixed Drop Ships, about six feet long. They weren't flying ones but the front flap opened and the A.P.C. came out. One of these shots I remember very well. It was a process shot where the Drop Ship is flying past the Atmosphere Processor. We had to have depth of field as the Atmosphere Processor had to appear massive. We used a Nikon lens on the front of the camera and with the lack of light we had to have a longer exposure. Q: Yes, the so called fly-by miniature Atmosphere Processor shot. Not one of my favourites. MA: Well, we spent a good deal of time on that one set-up to try and relay the massiveness of the structure. There was also a fly-by shot we did using a video camera. With the light at such a low level and with old style video camera you would see so called "comet tails" which with the new technology video cameras you don't see any more. We shot this sequence to get these tailing effects and the image was relayed onto the tv screens inside the A.P.C. so the actors could react to it. Q: Can you tell me about any interesting set-ups that you were apart of? MA: There was one sequence where we were filming the A.P.C. model as it was speeding down a ramp into the Atmosphere Processor. I was on what can only be loosely described as a skate board. I had to crawl in the tunnel that was only about three feet wide and they would stick wedges behind the wheels so that when they were removed I would go speeding down this ramp backwards on the skate board. 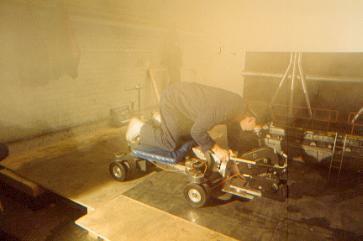 Harry Oakes's unit had a very complicated set-up with the and the Processing Plant. They used a semi-silvered mirror to reflect a jet of steam 90 degrees away from the model. Q: You are credited on Aliens, many of he crew members I am talking to were not. What are your thoughts on credits and are you happy to be credited on this film? MA: If I feel I have done a good job and sufficient work then it is useful to have a screen credit. Q: The VFX call sheets list Chris Knowles as director on Harry Oake's unit and I can't remember who is on Leslie Dears. Can you tell me a little bit about the way the units worked on stage? MA: Chris, who was the assistant director for the model units, was working between the stages, spending some time on each. The Skotaks were liasing with Jim Cameron who frequently viewed the rushes and they would come in in the mornings with feedback from the director. Much of the time Chris wasn't around so there was no director as such. We had the unit call sheets, storyboards and video storyboards and would just get on with the days shoot. Early on we would set up the shot, the Skotaks would come in and give some input, however this was taking too long so eventually we would just shoot it and it would be sent on for approval. Note: Mr. Anderson would like to hear from Film schools in the U.S. interested in a visiting lecture program on the subject of Special Effects photography. I would be happy to put you in contact with him.